This evening, Nestle can turn the spigot and begin filling its fleet of twenty-five 8,000 gallon trucks each day. Many consider a drop in the bucket the 65 million gallons of water Nestle has the rights to bottle and sell every year, at least in terms of the impact on the Arkansas River and its aquifers. Chaffee county’s permitting process produced a document listing 44 conditions Nestle had to meet before it pumped a drop and that it must continue to meet as pumping continues. County Development Director Don Reimer, who today issued the notice to proceed, is tasked with monitoring the operation on an ongoing basis to ensure compliance. Conditions include such things as monitoring the condition of wetlands and groundwater to ensure that the pumping operation does not have a negative effect. It also includes a stipulation that at least half the truck drivers have primary residency in Chaffee County and that Nestle attempt to hire 100 percent of the drivers from Chaffee County. 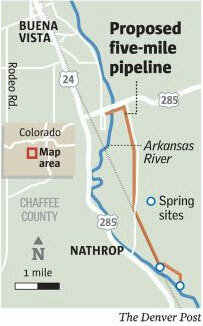 More Nestlé Waters Chaffee County Project coverage here. ← Energy policy — hydroelectric: Micro-hydro plant for Mountain Village?